Running Press Kids, 9780762462476, 40pp. Pink is for boys . . . and girls . . . and everyone! 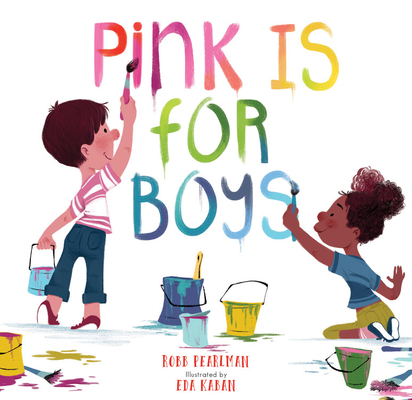 This timely and beautiful picture book rethinks and reframes the stereotypical blue/pink gender binary and empowers kids-and their grown-ups-to express themselves in every color of the rainbow. Featuring a diverse group of relatable characters, Pink Is for Boys invites and encourages girls and boys to enjoy what they love to do, whether it's racing cars and playing baseball, or loving unicorns and dressing up. Vibrant illustrations help children learn and identify the myriad colors that surround them every day, from the orange of a popsicle, to the green of a grassy field, all the way up to the wonder of a multicolored rainbow. Robb Pearlman is the author of many books, including Groundhog's Day Off, Raggedy Ann and Andy: Leaf Dance, and Passover is Here!. Today, his favorite color is blue, but it may purple tomorrow! He grew up in New York City and now lives in a white and green house in New Jersey with his husband and Oscar, the butterscotch-colored best puppy in the world. Eda Kaban was born and raised in Turkey and has had a passion for drawing, reading, and monkey bars since a young age. She is the illustrator on a number of books and when she's not drawing, you can find her climbing rocks or biking the hills of the Bay area. She and her husband live in Oakland, California.